A look inside the 1992 presidential race, D.A. 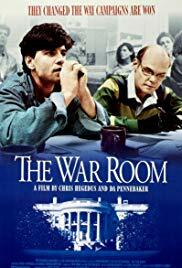 Pennebaker and Chris Hedgus' documentary The War Room explores the backstage side of national politics by examining the day-to-day operations of Bill Clinton's campaign staff. The behind-the-scenes leader of the group is James Carville, the demonstrative, charismatic campaign manager who relies on a plain-speaking manner and emotional appeals to motivate his subordinates. He is complemented by the quieter, smoother personality and photogenic looks of young press spokesman George Stephanopoulous. The filmmakers follow these two contrasting personalities from the January New Hampshire primary to Clinton's eventual victory, as they attempt to cling to an overall strategic plan while dealing with unforeseen problems and negative press, as their candidate is saddled with accusations of adultery and draft-dodging. Subplots include the rivalries between Democratic campaign staffs -- which can become amusingly petty, as when they accuse each other of tearing down campaign posters -- and the romantic relationship between Carville and Mary Matalin, chief strategist for George Bush's campaign. Co-director D.A. Pennebaker (Monterey Pop, Don't Look Back, Primary) is renowned as an innovator in the use of cinema-verite, used here to show both the mundane complications and the emotional highlights of the modern political process.